KEYRUS | Big Data: When Marketing Takes Over Power From The Consumer'actor""
Big Data: When Marketing Takes Over Power From The Consumer'actor""
Businesses and their brand assets follow courses of development governed by the Darwinian theories. Influenced by their environment and subjected to fierce competition, brands are born and die each day to the rhythm of natural selection, subjected to the balance between supply and demand. Businesses transform themselves to adapt to revolutions, following cycles. Financial crises, environmental issues, sustainable development, the responsible business, Internet, also even mobiles and social networks, numerous are the concepts which, with each decade, have encouraged businesses to reinvent themselves and to re-position their brands. The 2000s witnessed the arrival of the Internet era, which radically changed numerous sectors like never before. As with advertising in its time, the players involved in business strategy had to integrate these new parameters to re-programme the genetic heritage of the brands. The Internet era saw consumers take power over from the marketeers. More expert, online, in networks, the internet user, who has become a consumer'actor, influences product and service offerings, prices and all the values which constitute the genome of brands. Certain businesses gave in to the dictates of customization and of crowd sourcing to satisfy these new forms of consumption behaviour in which exclusivity and the "persona market" take precedence over the massmarket. Exposed to these new predators, the marketeers were stripped of the power which the "Jacques Seguela" era of communication had given them. The cards were re-dealt and numerous businesses such as retailing were re-configured. Far from stabilizing, the environmental factors are more and more numerous, mobile habits are the new influencers, adding to the internet user's power the real-time factor and spatial pinpointing. Transformation cycles are getting shorter, and each year sees the appearance of its batch of unpredictable factors to which businesses are forced to adapt, like the social networks and the online devices, stimulating the breeding ground of the Big Data phenomenon. Practices establish themselves faster than markets can integrate them and businesses have no other choice than to be agile in order to survive. DATA : THE SUPER POWER OF THE MARKETEER ! As numerous theorists agree, the mathematical modelling of the market is far from being hypothetical. Finance made the move several years ago. In a mode of profusion of data, businesses see new professions, christened data scientists, being born : capable of deciphering their structures to promote understanding of markets, clients and their dynamics. The interaction between the market and consumers generates more data each day. The globalization of the business and the digitalization of its points of contact with the consumer allow a gigantic equation to form. If mathematics is very present in nature, it is also present on the market, and the modelling of complex systems, machine learning and the abundance of data allow them to position themselves amongst the essential tools for the creation of value. The traditional marketing models are outdated, as are the business's levers of action on their market. Marketing effectiveness, as we know it, stems from know-how which is more than 40 years old ! Built upon deductions based on studies and upon intuitions founded on a pre-supposed knowledge of behaviour patterns, these marketing theories lead to a segmentation of the target favouring a rather crude personalization of the relationship with the brand. While in the past it was swayed by the message or the values behind a brand, in the future the behaviour of the consumer will induce the prediction. Accompanying the satisfaction of the consumer's need more effectively, predictive models are causing a new "race" of brands and product and service offerings to emerge. The new marketeers surround themselves with "data scientists" in order to make sense of the data produced by their ecosystem comprised of tablets, mobiles, Internet sites, sales points, loyalty programmes, social networks, etc. By the data that it generates, each new interaction with the consumer unveils a facet of their behaviour, a part of their equation. To implement these predictive systems and model the behaviour of consumers it is first necessary to equip oneself with the capabilities of acquiring and reconciling several sources of data. The first are the so-called "public" data : the data generated by internet users' activities and called 'logs', the data stemming from social networks, mobile applications, advertising platforms, Open Data etc. the entirety of the traces coming from the different points of contact with the consumer. The particularity of these data resides in their so-called "multi-structured" formats and the frequency of their calculations, in real time for some of them, or on a weekly or monthly basis for others. These "public" data can be compared with the "private" data of the business, such as, for example, that stemming from CRM tools. These internal data add a new dimension to the model and offer a more precise vision of the client, a better understanding of their behaviour patterns and pave the way for defining a more refined segmentation, a more precise sales policy, and ultimately having a more effective business. Comparing these different strata of data highlights behaviour patterns, materialized by "events". By pushing the analysis further one can isolate their "frequency", the probability of their re-occurrence and the triggering factors called "insights". All this thanks to the application of mathematical models. It is essential to stress the importance of this initial approach which lays the foundations for all modelling. Being very methodical, the comparison of these data must be undertaken step by step by planning the addition of the sources so as not to have the first findings disturbed by the interference generated by the flood of information. This initial phase allows events to be identified and correlated. Once they are presented to the Marketing department they take on meaning for the business. The purpose of this system is not so much to know why a consumer has made a purchase, but rather "how" did we get him to make it and what were the factors which triggered the act of purchasing. This new vision of marketing, which is possible only through an approach based on data, relegates the standard models to the prehistoric era. This marketing revolution gives a new dimension to the understanding of purchasing behaviour patterns, a level inaccessible to the human brain able to process only a few dozen factors, but a playground for computers compiling billions of pieces of data in order to highlight behaviour patterns. A number of analysts see these new concepts as a technological, philosophical and scientific revolution. These models allow the human being to reach a new stage of understanding of his environment and of himself. An often suggested parable is that of the addition of several images viewed rapidly to form a film. These models help the human being to understand things which are unintelligible. The human being has always dreamed of predicting the future, and today this is no longer science fiction. Big Data projects and the thinking which flows from them push systems to interconnect with eachother so as to organise the collection of information. Big Data radically changes organisations, decisions, achievements. It needs to be understood that up until now database administrators modelled tables so as to structure the storage and the retrieval of data for business needs. The developers devised applications to manipulate data on the basis of business processes expressed by project management such as client relations. This modelling is outdated and cannot be maintained THE REVOLUTION OF DIGITAL PERFORMANCE BY BIG DATA EXPERT OPINION Big Data & Analytics Keyrus® - All rights reseved THE REVOLUTION OF DIGITAL PERFORMANCE BY BIG DATA faced with new market challenges such as cross-channel. The granularity of the information obtained by Webanalysis or that coming from the social networks is too fine! The problem is the same for the marketing principles of segmentation or targeting based on socio-professional category, these models are outdated because they have been rendered obsolete by the interaction of data systems which express "unpredictable" relationships in data and their "unintelligible" behaviour patterns. The revolution lies in turning a fundamental tendancy on its head : one no longer requires that data demonstrate a hypothesis, an intuition, but rather, working from the data, one identifies facts and one thereby constructs tools which are much more effective. Data creates and controls practices. The revolution has become possible through technological change, and in particular the storage and processing of very large volumes of data. In the medical sphere it is often said that only 5% of data collected are used for taking decisions. Imagine applications allowing the remaining 95% to be taken into account! Beyond storage, IT developments have enabled the processing, in parallel, of large volumes of calculations and business processes in order to interpret the data obtained. The revolution lies in the ability of Big Data to return power to the business by making it more agile, more intelligent, at a cost which is kept under control. Big Data is to marketing what the agile method is to IT. Big projects costing several hundred thousand euros or – for certain businesses – several million euros and which end up paralyzing practices by their over-ambitious specifications should not be taken on. Big Data is approached through the creation of prototypes also called "Proof of Value" (POV), a "test and learn", agile-type method of thought. That means accepting that mistakes will be made, that it is better not to persist with certain disappointing modellings in order to concentrate resources on the most effective ones. Numerous clients indicate how worthwhile this approach is, and in particular the level of serendipity which it reveals. By interpreting data one discovers unexpected practices. Agility and plasticity best describe Big Data architectures. The general principles are to gather heterogenous data through flows, to consolidate the data, check its integrity by correcting imperfections or accidents. One then applies a phase of mathematical synthesis to the data which maps it in order to create links and highlight events. Probabilities allow the level of chance of each event to be defined so as to shut out background interference. In this type of project the technology must be transparent. A POV must not exceed a few weeks and the IT, or mathematical, complexity is the service provider's problem, only the "business scenarii" count. The principal uses of Big Data in digital marketing are the ultra-personalization of clients' pathways or the optimization of the churn through the detection and the addressing of risky behaviour patterns. The sectors which use it most are telecommunications, banking and retail. Big Data promotes understanding of complex pathways, of new cross-channel behaviour patterns such as Web to Store. For example, Big Data enables the issues facing retailers in their drive-to-store strategies to be adressed. Merchants report a reduction in the average spend or a lengthening of the restocking cycle. Applications enable one to offer highly targeted promotions valid over a short period in order to trigger the act of purchasing, or ultratargeted upselling at the moment when the products are collected in the store. These tools also make it possible to calculate the medium- and long-term impact of promotions on loyalty or on product and service offerings, the impact of floating-date sales on profitability, etc. Numerous business cases are published on Internet like the case of PriceMinister where Big Data played an important role in the definition of their e-mailing strategy. On the one hand they had destocking offers coming from the marketplace (high frequency over short periods) and on the other, their marketing database with a traditional segmentation. They held the conviction that segmentation – or sampling in the framework of pre-tests – was a source of errors and reduced the effectiveness of e-mailing operations and caused a high churn rate. With a Big Data approach they were able to fine-tune their knowledge of the database and extract more specific targets in each campaign. By doing this they discovered that grandmothers liked playing Pokémon and that grandfathers did not offer Pokemons just to their grandchildren! This approach multiplied the effectiveness of the campaigns by a factor of 10 (targets with whom there was a greater affinity) and limited churn. As an example of another approach, the Allociné company was encountering a problem faced today by most online media : a need to enhance the value of the advertising space and of the marketed audience through data versus the page viewed. As an illustration, 25% of Allociné's audience is generated through their mobile applications for less than 5% of turnover. Thanks to a Big Data approach, with several hundred million interactions analyzed per day through a cross-media approach, they can today address users whose centers of interest are identified and not simply pages viewed. Thanks to these new approaches, Allociné markets services to film distributors enabling them to assess the commercial viability of a film by country, region, county or town from the day of the film's release in order to manage the number of copies to be supplied. Thierry Picard is Deputy CEO of Spikly, the digital agency of the Keyrus group. 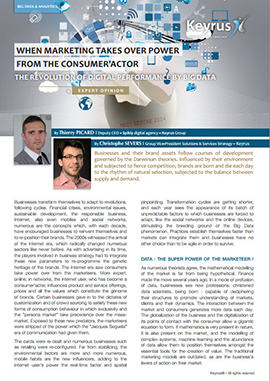 With 15 years' experience managing Internet projects, he has made a name for himself notably in the luxury goods and press sectors by taking on the management of international e-commerce for the Hermès group and the management of the internet activities of the Nouvelle République newspaper. Christophe Severs, Vice-President in charge of Solutions and Services Strategy for the Keyrus group, possesses more than 15 years' experience promoting the enhancement of the value of data. He began his career in the Actuarial Studies department of Fortis (Belgium) and went on to assist and advise numerous businesses in defining and undertaking their Business Intelligence and analytical strategy. Combining a strong affinity for quantitative approaches and a firm footing in the economic reality of businesses, he is also in charge of the deployment of new Big Data Analytics offerings by the Keyrus Group. Christophe Severs is a Physical Sciences graduate of the Université Libre in Brussels and also holds an Executive Masters In Management from the Solvay Brussels School of Economics and Management.